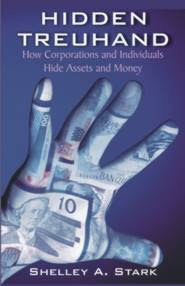 Shelley Stark is the author of the book Hidden Treuhand: How Corporations and Individuals Hide Assets and Money and, like the subject of the previous blog, someone who has suffered personally from secrecy jurisdiction operations. She writes for us here as guest blogger about the Hidden Treuhand, complementing our earlier work on trusts. Financial crises linked to tax havens that offer legal protection and security to facilitate covert economic activities; lack of transparency and accountability a central issue. The use of hidden trusts has been identified as a means of operating without transparency because beneficial ownership and control of any asset, located anywhere in the world, operates in anonymity. Hidden trusts created in tax havens operate under very different rules and are referred to as ‘Treuhand’ in the German language. A hidden ‘Treuhand’ is completely non-transparent, only somewhat legal, and operates covertly by owning the asset through a corporate structure, where real shareholder identity remains anonymous in all business dealings. Lawyers are often called upon to act as a ‘trustee’ in a hidden ‘Treuhand’. There is no law regulating hidden ‘Treuhand’, only law specifying that the lawyer cannot divulge any secrets pertaining to the client. This kind of trust is not so much protected by law as protected by lawyers. If questioned, the lawyer will simply evoke attorney-client privilege. ‘Treuhand’ contracts enjoy great protection by law. The Austrian Lawyers’ Chamber has taken great steps to alleviate any fear of embezzlement by a lawyer through a Treuhand contract registration process. Registration is optional and ensures beneficiaries that the asset held in a Treuhand contract is accessible only to the parties involved, while providing bank assurances that the responsible parties are accountable. In the early 1990s, cavalier ‘Treuhand’ activities gave way to multiple cases of embezzlement and threatened to destroy the institution of ‘Treuhand’ in Austria. The client’s anonymity was used against the client to embezzle property, much to the chagrin of banks financially involved. Banks, caught in the fray, forced the legal community to take action to ensure both clients and lending institutions that embezzlement by lawyers would cease to occur. The solution to this dilemma is detailed in a legal brief written in 1996 by the current Vice President of the Lawyers’ Chamber, Dr. Gerhard Horak: if lawyers are going to create hidden ‘Treuhands’, keep them as flexible as possible, and yet not have the legal authorities involved, then lawyers themselves would have to find a way to regulate their colleagues. The response from the Austrian legal community was the creation of the ‘Treuhand Handbook’—an agreed upon set of guidelines drawn up by the Lawyers’ Chamber and a registration system. Their goal was to offer clients security and efficient control regarding ‘Treuhand’ transactions while maintaining freedom to arrange contracts and operate as flexibly as possible. 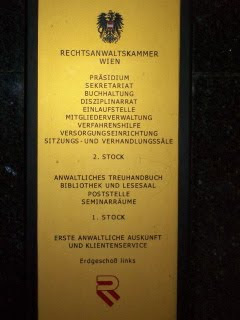 The registration of a Treuhand raises several points relevant to the current financial crisis. Firstly, participation by either the lawyer or client is optional. Secondly, if the client opts for registration, the client can be assured of maintaining control without being present because the lawyer has carry out all orders kept on file. Lastly, clients could not even turn to tax records as a means of getting their property back. In essence, Dr. Horak’s brief provides proof that hidden ‘Treuhand’ facilitates tax evasion and that the Austrian legal community is painfully aware of this fact. The Austrian Legal Chamber provides special conditions and security for ‘Treuhand’ clients, whereby the client’s beneficial ownership of an asset can be registered under a number much like an anonymous Swiss bank account. Banking secrecy only protects money from public knowledge, but a registered hidden ‘Treuhand’ offers the beneficial owner security and secrecy for assets capable of producing equally secret income. Lawyers have formed their own ‘Treuhand’ regulating system to keep lawfully binding regulations from being imposed on the industry and yet maintain the freedom to make contracts that reflect the will of the parties without losing the cooperation of the banks. The lack of lawfully binding regulation offers a Wild West land of opportunity for those who can conceive of a business plan made more advantageous when the identity of the benefactors is completely concealed from public. Perks for lawyers and their clients range from tax avoidance to outright tax evasion because neither one need declare income that cannot be traced. Moreover, it is an industry for which the lawyers themselves are the first line of defense. These lawyers have created secret legal structures despite efforts from the international community to work within and enforce the rule of law as practiced in democratic societies. Now banks are again caught in the fray, only this time they are both perpetrators and victims. Dodgy debt in the US sold as a risk hedge to banks worldwide is one of the reasons the financial crisis is so viral. The lack of transparency involved in these transactions is why many are beginning to feel that tax havens bear a huge responsibility for transpiring events. Nebulous financial undertakings and ‘Treuhand’ accounts in Austria, Liechtenstein, Luxemburg, and Switzerland are now impacting economies outside their borders. For example, the UBS indictment concerning 52,000 US citizens with Swiss accounts and Germany’s scandal regarding the LGT bank in Liechtenstein. High net worth individuals and corporations from all over the world come to these jurisdictions not just to evade taxes, but also to hide their beneficial ownership of an asset in another country. The key role played by hidden ‘Treuhand’ is to prevent transparency regarding economic activities, not just beneficial ownership. As a result, non-transparent economic activities are encouraged. Shelley Stark is the author of Hidden Treuhand: How Corporations and Individuals Hide Assets and Money, published by Universal-Publishers. I read Ms. Stark's book shortly after it came out. It became abundantly clear to me that she answered how some of our elected or appointed officials were evading the conflict of interest laws or policies which require divesting oneself of financial relationships with certain corporate or investment entities depending on the area of influence or oversight the official has in their offical capacity. And the most frustrating thing to me is that so many people I try to share this with just don't get it. They cannot afford not to "get it." This financial crime is affecting all of us profoundly, particularly those who work for a living and don't have international banking and lawyer resources at our fingertips. Some serious financial education is needed by Americans as soon as possible. But first, they must see why this is necessary and important. Shelley Stark's book is a good start, but I would like to see her continue with other contributions in this area with help from organizations such as the Tax Justice Network. I have bookmarked your site now that I've found you.